Cut loaf of dough crosswise into 4 pieces to make rolls. Place rolls seam sides down and 2 inches apart on cookie sheet. With sharp knife, cut 2 diagonal slashes, 1/2 inch deep, on top of each. Bake 21 to 24 minutes or until golden brown. Cool 2 minutes. Meanwhile, in 2-quart saucepan, mix soup and beef; heat to boiling. Reduce heat; simmer 5 minutes. With serrated knife, cut rolls in half horizontally. 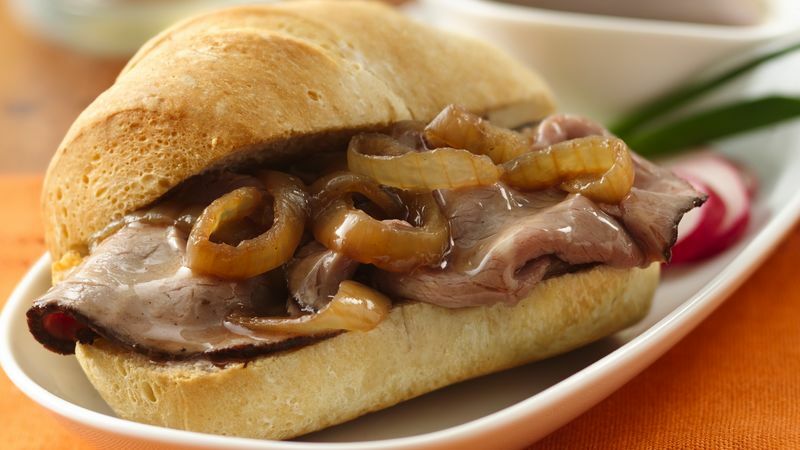 With slotted spoon, place beef and onions on bottom halves of rolls. Cover with top halves of rolls. Serve sandwiches with remaining warm soup for dipping. Complete your meal with a mixed greens salad with a vinaigrette dressing.